Yes I know, I know...have you spotted it too? 3.5 metres of my favourite discontinued Cath Kidston's Rose Bouquet (with a blue background) found in a tiny, ( & I mean tiny 3x3 m) remnant shop in Totnes. 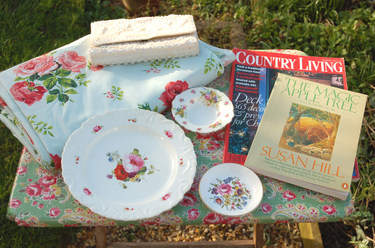 I exclaimed in delight and snatched it up as fast as lightening saying to the owner, "This is Cath Kidston!!" "Oh, I did wonder but there wasn't any name on it." She smiled at my delight as I paid my £13.00 and left with a cheery, "You have made my day, thank you!" To all of you not in the know, like my mother and husband, Cath K fabric usually starts at approx £30 per metre! It had already turned out to be a good finding day as I found a stash of old Country Livings, a copy of my all time favourite book, a vintage, sequined evening bag, and various small rose patterned dishes that I use for the cats' food, and a couple of rose patterned dinner plates. A bit later on I came across the small fold up table, which is in the photo, complete with Cath K oilcloth, which only needs a lick of gloss paint to complete it's transformation. Didn't I do well? One not so good thing was that even though I carried my enormous camera around all day, the rain, greyness, & road works prevented me from taking any pictures. Sorry. They would have been bad anyway I can assure you! I have decided this year to take more pictures and do more posts of life in Devon & England. Today, is a beautiful, cold & sunny day so a walk with the camera (hopefully) will happen this afternoon. Enjoy yours where ever you may be.